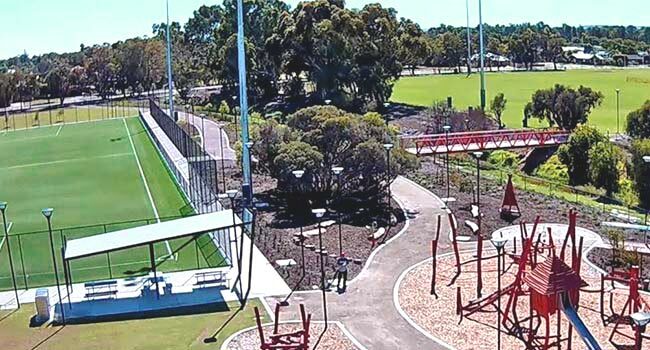 We are happy and proud to announce that the Stage 1 redevelopment plan of Mills Park in the City of Gosnells has been completed. 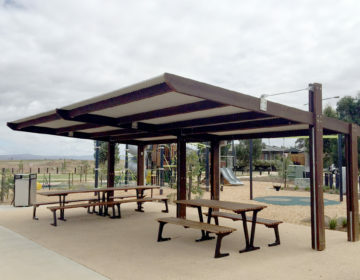 This multi-million dollar project started in 2014 which aims to provide a recreational space with high levels of sport and passive recreation use to the community. The second stage has started and set to be completed in 2017. 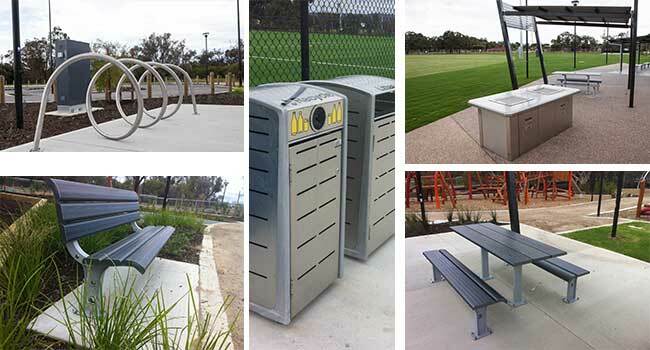 Landmark provided twenty-two (22) park shelters, San Remo picnic settings, seats and benches, Eco-Double BBQs and Furphy Foundry drinking fountains, bike racks and bin enclosures around the area. 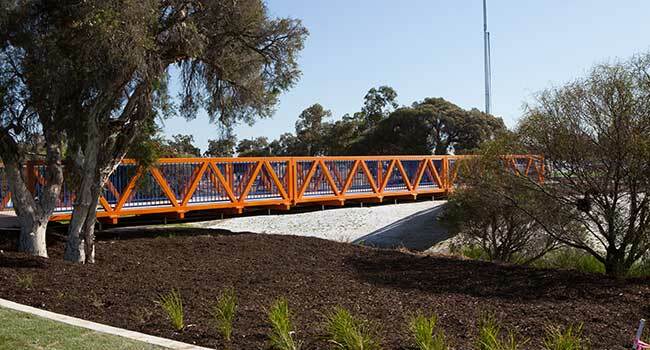 One Murray series steel truss pedestrian bridge that connects the playground walkway to the Cricket facility, and a total of 183 metres of boardwalk with a piazza was installed as a prefabricated kit-form structure using HDG steel with Einwood WPC decking. The sport facility is the highlight of this project. 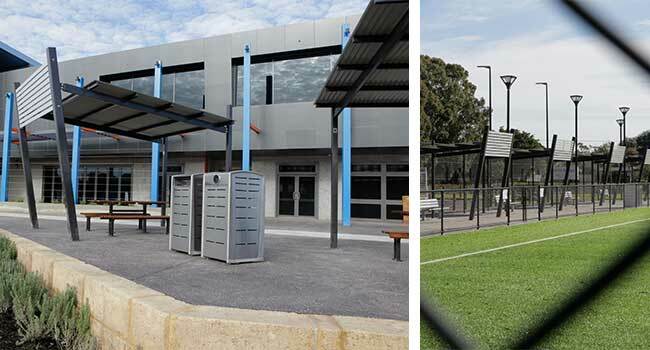 After the framing and lock-upstages (see our Part 1 article), we discuss the fit-out and final stages of this sports facility. The kiosk will welcome local clubs to sell food and drinks to those who come to the venue. 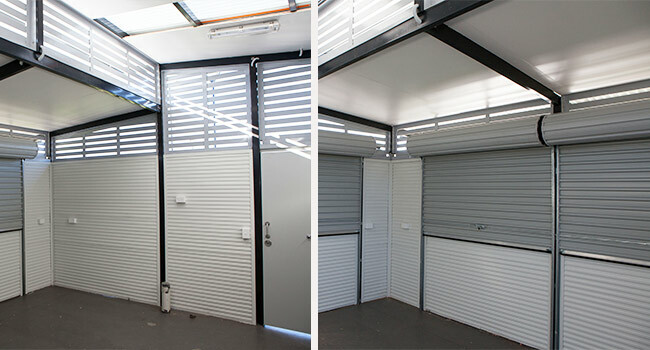 Measuring approximately 5m long by 4m wide, this area provides an adequate space the final fit-out. 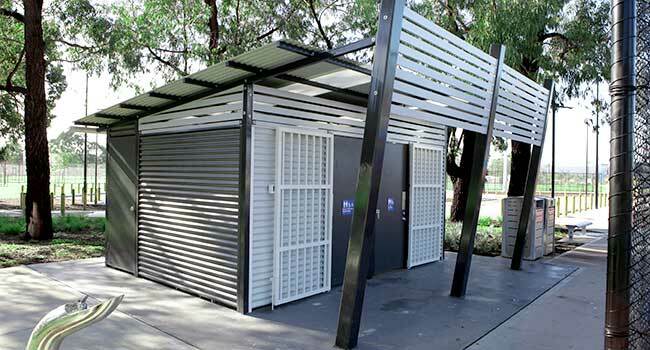 It is equipped with three roller windows; two (2) 900m x 1800m and one (1) 2100m x 2400m Colorbond Security Roller Doors with security stiffener and internal locking system. 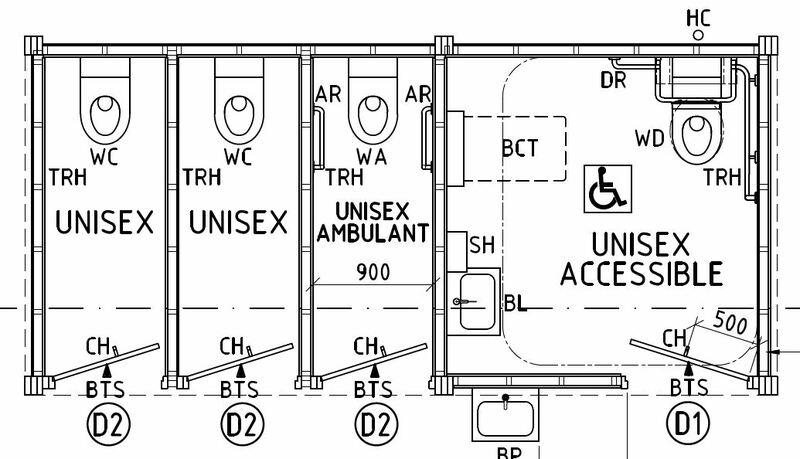 The home team and away team can have their own change room regardless of gender. Each room has a changing area with bench seats where the players can sit, rest, talk about their game plans and change into their sports apparel. This area serves as a security hallway leading to individual shower and toilet cubicles. 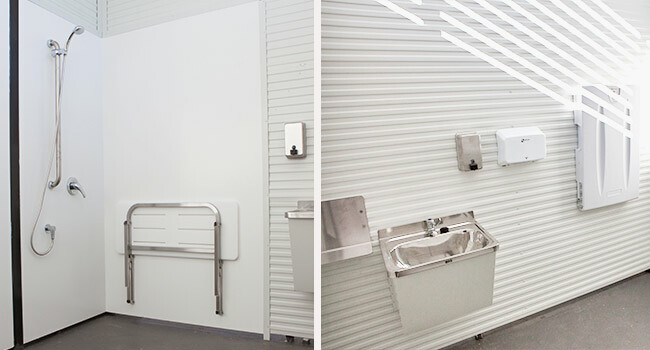 The shower/toilet area has three (3) hand wash basins made in stainless steel with anti vandal Colorbond shrouds. 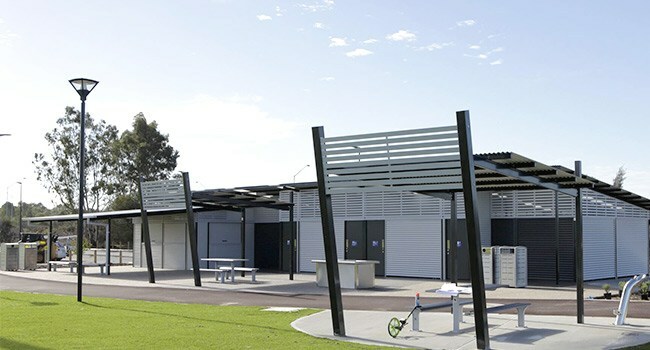 We have used Stratco Maxirib horizontal internal cladding for walls and Colorbond Clad Solid Core doors for the facility to provide a robust solution. 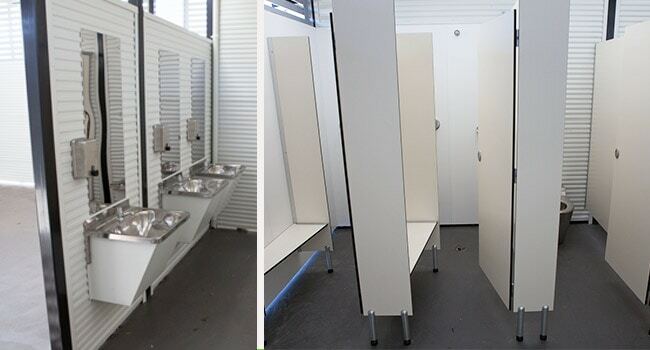 There are two (2) unisex accessible cubicles each equipped with fixtures, fittings and circulation space designed to meet Australian Standard 1428. One accessible cubicle has its own shower area and a baby changing table. 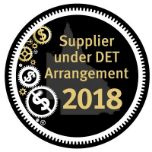 We would like to thank Cardno, Ertech Pty Ltd and the City of Gosnells council who have been our great partners with this project. As we have completed Stage 1, we started working on Stage 2 of the project.